How can you make your bottom look great without plastic surgery? According to Levi’s their 501 jeans are the solution. 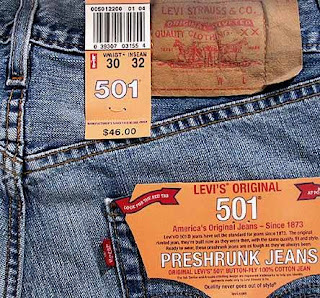 Still being the most famous model of the brand today, Levi’s 501 comes from the reference number which was originally on the cloth the jeans were made of. The history of Levi’s jeans dates back to 1847, when the Bavarian Levi Strauss arrived in New York. Six years later he moved to San Francisco, where he would later develop a new type of trousers with Jacob Davis. “Jeans”, which were then called “waist overalls”, were born. Yet, it is worth noticing that these two inventors hadn’t created a new cut since the trousers already existed as a working garment for miners in California. Their brainwave was to add rivets to them. In 1890 the first 501 jeans were produced together with the 201 model, a cheaper version. They would later undergo various changes such as the addition of two back pockets in 1901 and the apparition of belt loops twenty years later. After the Second World War, a new version was released without cinch and the first zippered version was introduced in the 50s. The word “jeans” replaced “overalls” in 1960, while they were becoming more and more popular during the hippie wave. The brand would also benefit from the rise of television, airing their first TV-commercial in 1966. The 80s were a turning point in its history: the first 501 jeans for women were created and the best known advertising campaign “501 Blues” was launched on the occasion of the summer Olympic Games in Los Angeles. Evidence of the campaign’s impact was the creation of a musical in France with the same name. Nearly 120 years after their creation, the 501 jeans have remained quite popular. Their success is due to their constant renewal. Worldwide known and representing 50% of the brand’s sales, the 501 now targets teenagers mainly, which clearly shows its evolution. The pants have lived on through time, just like Shakespeare. Levi’s reminds us of this in their 2005 commercial which was an adaptation of A Midsummer Night’s Dream.